Utility customers in Michigan would have the option of choosing between a new “smart” meter and existing traditional equipment to measure their home energy usage under legislation introduced last Thursday by Rep. Gary Glenn, R-Midland, and Rep. Rose Mary Robinson, D-Detroit. The bill would put into force an opinion by Attorney General Bill Schuette that the utility companies lack the authority to charge fees to customers that opt out of an advanced metering program, which was dismissed this past week by the Michigan Public Service Commission. Electric companies are transitioning to the advanced, or “smart,” meters to capture and transmit usage information in real-time so the utility can reportedly better manage the power grid needs and delivery. The smart meter initiative has raised cyber-security concerns, as well as issues about customers’ private information, prompting Rep. Glenn’s solution to provide a choice. WXYX in Detroit reported on the new legislative effort recalling how the utility company DTE had recently turned off the power for a 92-year old lady for refusing a smart meter, saying it had acted in the “best interest of the customer and the community by turning off her power.” Really? Does anyone expect us to believe that statement? View the video clip below for more information on this story. Consumers in Michigan should contact their local representatives to voice their opinion of HB 4916. Although a positive development, SkyVision Solutions has not seen a copy of the actual proposed legislation. Press reports mention a potential opt-out charge of up to $5 per month. This means it may still cost money to avoid the risks related to smart meters if the legislation is adopted. 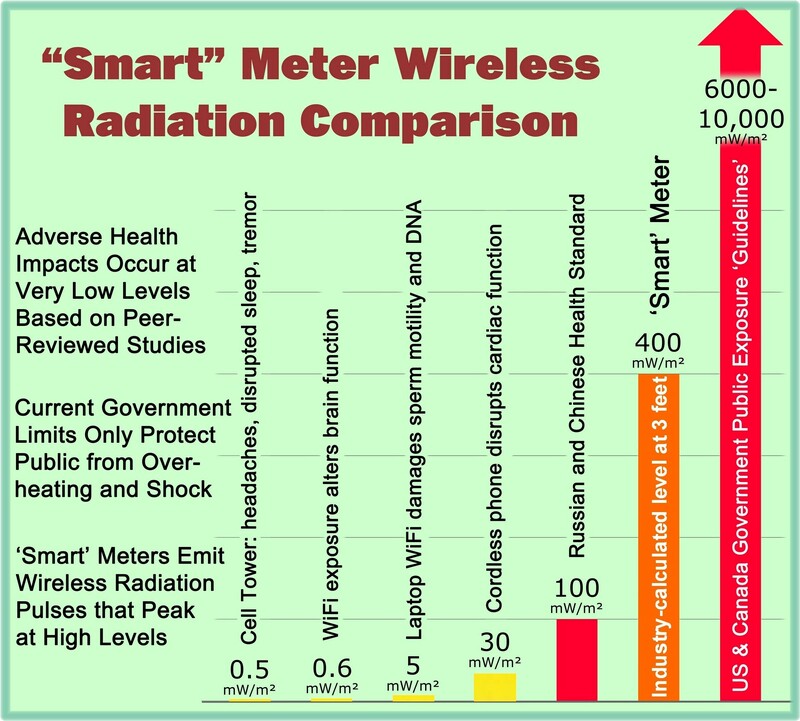 This entry was posted in Smart Grid, Smart Meters, and RF Emissions and tagged Consumer Choice, Smart Meters. Bookmark the permalink. Payment to avoid harm is extortion. Press reports were somewhat incomplete. It took a few days for the actual bill to be posted to the Michigan Legislature website. Upon review, it is apparent that the $5 per month potential charge is only applicable if a customer doesn’t agree to read and report one’s own usage for a traditional meter. A link for tracking bill progress has been added to the article. Need information as to how to track and report one’s own usage. A UTILITY SHALL ALLOW EACH CUSTOMER TO READ AND REPORT THAT CUSTOMER’S SERVICE USAGE IF THE CUSTOMER REPORTS REASONABLY ACCURATE USAGE ON A REGULAR BASIS. A UTILITY SHALL PROVIDE A CUSTOMER WITH A PREADDRESSED ENVELOPE AND FORM UPON REQUEST OR PERMIT A CUSTOMER TO REPORT METER READINGS ON A SECURE WEBSITE, BY TELEPHONE, OR BY OTHER REASONABLE MEANS. If you live in Michigan, I suggest you contact your local legislators in support of this bill (HB 4916). AGAIN THE ISSUE OF DETRIMENTAL BIOLOGICAL EFFECTS WITH THE “OPT-OUT” METERS WHICH STILL REPORT DIGITALLY [AND THE] THE SMPS … I KNOW, BECAUSE I STILL FEEL THE VIBES WIITH THE ‘OPT-OUT’ METER… I AM NOT ALONE IN THE INABILITY TO SLEEP BECAUSE OF THESE MINI MILLI VIBES UP AND DOWN MY SPINE, WAKING ME UP IF I WAS ABLE TO SLEEP FOR A FEW MINUTES IN BETWEEN, HERE IT COMES AGAIN ! SOME PEOPLE ALSO HEAR THE METER SMPS VIBES. THE METERS ALSO AFFECT THE CIRCULATORY SYSTEM, PRODUCING HEART PALPITATIONS AND BLOOD PRESSURE PROBLEMS. THE LIST OF PEOPLES COMPLAINTS IS LONG AND CONSISTING OF MANY MORE COMMONLY NOTICED HEALTH PROBLEMS.